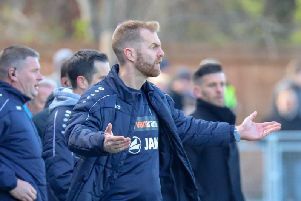 Harrogate Town boss Simon Weaver said he was “proud” of his side’s performance on the opening day of their debut National League season, adding that he felt they deserved to take all three points. Goals from Jack Muldoon and Kelvin Langmead saw the men from Wetherby Road overturn a half-time deficit at home to Sutton United, only for the Amber & Chocolates to nick a share of the spoils courtesy of a late, late penalty. “I couldn’t be prouder of the lads, this was a step up and I think we warranted a victory,” Weaver reflected. “It was a whole-hearted performance, for large spells we were on top and then we showed great character, and that gets tested when you have the lion’s share of possession and chances and find yourselves 1-0 down. “I thought we had done enough to win it, but then they got the penalty. It’s a mistake, but it happens in football. “Without a doubt, Sutton will be top three in this league, so this result gives us a massive confidence boost.